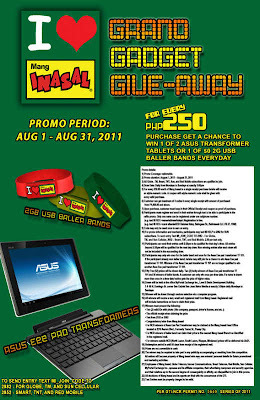 Mang Inasal Gadget Giveaway ~ Philippine Freebies, Promos, Contests and MORE! For the whole month of August, visit and buy your most loved Mang Inasal meal because this might be your ticket to win an Asus Eee pad transformer TF 101 or baller bands in Mang Inasal's Gadget Giveaway. For every P250 single receipt purchase of Mang Inasal products, you will receive one (1) coupon with alpha-numeric code or a maximum of four (4) codes in every P1,000 and above worth of purchase. Register for FREE by texting MI REG [CODE] (e.g. MI REG 9). Also, send your entries by texting MI space JOIN space CODE and send to 2982 for Globe, TM, and SUN or 2952 for Smart, TNT, and Red Mobile. A standard rate of P2.50 per text is charged. One (1) name is equivalent to one (1) cellphone number and code may only be used once to earn an entry. Open to all Globe, TM, Smart, TNT, Red Mobile and SUN Cellular subscribers who are Mang Inasal lovers. Send entries until 2:30PM to be qualified for that day's draw. Entries beyond that time is counted for the next day. View complete promo mechanics or text MI HELP to 2982 for SUN subscribers.